How to reach Rome's cruise port by commuter train from Termini or Trastevere Station. ABOVE: A double-deck regional commuter train in Rome's Termini Station. 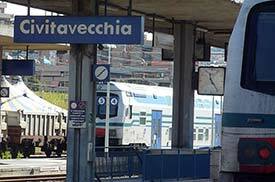 Traveling by commuter train is the cheapest way to get from central Rome to Civitavecchia. It works best when you aren't burdened with excessive luggage. 1. Pick your departure station. ABOVE: Trastevere Station in Rome. 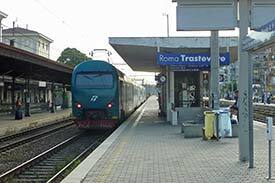 Trains to Civitavecchia depart from the main Termini Station in Rome, often with stops at Roma Tuscolana, Roma Ostiense, Roma Trastevere, and Roma San Pietro (close to the Vatican) on their way out of the city. Termini is convenient if you're near a Metro stop in Rome, since all Metro lines converge at Termini. ABOVE: A second-class car on a fast train. Some trains don't stop at secondary stations in Rome, so check the timetable carefully if you aren't leaving from Termini. 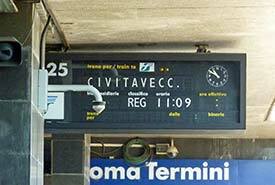 Fast InterCity and other national trains generally travel nonstop between Termini and Civitavecchia on their way to more distant cities. Travel time is short: about 41 minutes. Rete Regionale or regional commuter trains stop at half a dozen or more stations in the city and suburbs, and travel time can be as long as 1 hour 17 minutes. Tip: Double-deck regional commuter trains have large vestibules that are convenient for stowing bulky luggage, as long as you remember to keep your suitcases out of the traffic path and within your line of sight during the journey. ABOVE: A Rete Regionale ticket is superimposed on a national FS railroad ticket. At the ticket counter. This is easy in smaller stations, but at Roma Termini, ticket lines are often long. From a newsstand or tobacconist. 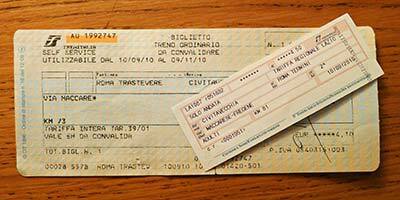 In Termini, Trastevere, and many other stations, it can be quicker to buy tickets at an edicola or a tabaccio than at the station ticket counter. From a Rete Regionale ticket machine. These machines require fewer steps to purchase a ticket than the Trenitalia machines do, but menus are in Italian only. You can buy a one-way or roundtrip (return) ticket, depending on your travel plans. 4. Find the platform, stamp your ticket, and board your train. ABOVE: A regional train's departure platform at Termini Station. Look for a yellow Partenze (Departures) table or an electronic sign in the railroad station to find the platform number for your train. Important: Validate your ticket in one of the machines by the trains before boarding. Otherwise, the conductor can charge you a hefty fine. 5. Get off the train in Civitavecchia. ABOVE: A platform in the Civitavecchia railroad station. If you're on a regional commuter train, Civitavecchia will be the end of the line. 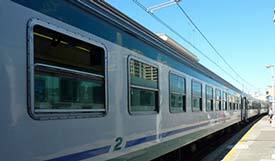 However, if you're riding a national train, you'll need to pay attention and be ready to get off at the Civitavecchia station. You can take an inexpensive shuttle bus from the train station to the port's shuttle-bus stop. For more information, see page 2 of our Civitavecchia Cruise and Ferry Port article. Several good hotels, including our recommended Hotel de "La Ville," are along the street between the station and the port.